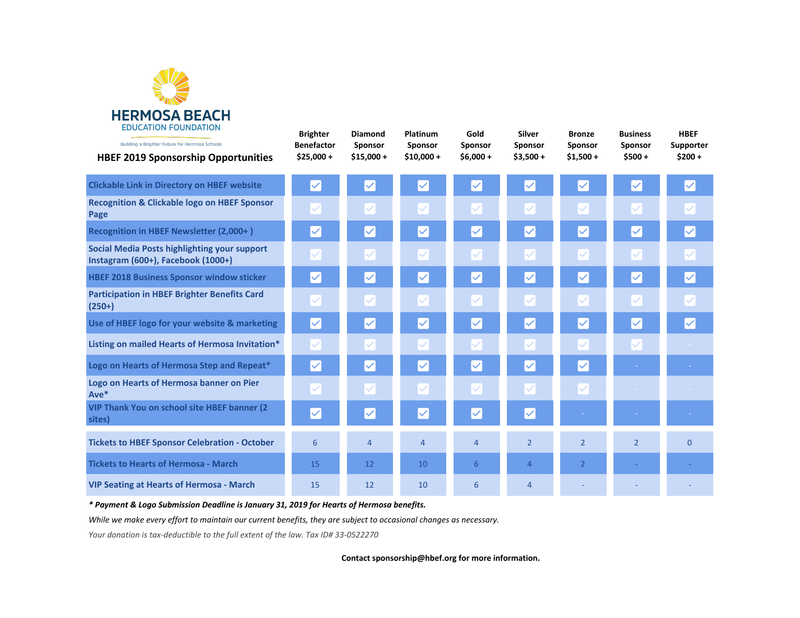 With a Business Sponsorship, you have the opportunity to directly market your business to the affluent community of Hermosa Beach while supporting a school district that is the 3rd lowest funded in the State of California. We are developing new ways to work collaboratively with our business sponsors to market and support them within our school community. In addition to the existing perks of event tickets, event banner, website, and invitation placement, we have added some new marketing opportunities including the Brighter Benefits Card and newsletter logo placement with a reach of nearly 2,000 parents, teachers and administrators. All corporate sponsors will receive a 2019 window cling and a social media mention. Sponsorships are an annual, all-inclusive opportunity. We hope you will join us as a 2019 Business Sponsor. *Agreement and Logo deadline is January 31 for Hearts of Hermosa publicity. *We kindly request that business owners with children attending Hermosa Schools meet the HBEF Annual Giving Educate level before participating in the Business Sponsorship program. Other ways to give include participating in the Brighter Benefits Card, event food and beverage, auction items, and gift bag donations, employee event volunteers, and media and entertainment partners.